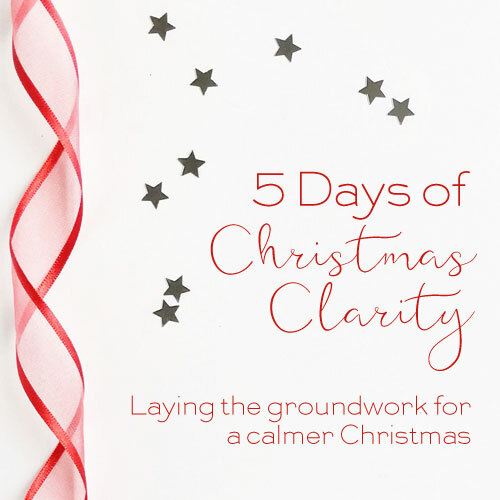 Start laying the groundwork for a calmer Christmas with this free five-day challenge. From Monday 29 October to Friday 2 November you'll receive an email a day designed to help you get clear about the kind of Christmas you want, how you want to feel, what you want to do, and how you can start to set down the foundations to have a calmer, more enjoyable Christmas. Each day of the challenge I'll be live in the Facebook group so make sure you join, there's a link in your first email when you sign up to the challenge. The 5 Days of Christmas Clarity challenge is free and begins on Monday 29 October. So add your email address in the box below and get ready for Christmas clarity! By adding your email address you will receive a 5 Days of Christmas Clarity email each day for five days and then my regular weekly emails. You can unsubscribe at any time from any of the emails you receive.